The Zambian government has decided that the Mukula tree will be undergoing auction sales for the benefit of the country, the Honorable Minister of Lands and Natural Resources Ms. Jean Kapata has said. Ms. Kapata says the ban on the sale of the Mukula tree by the private sector will not be lifted but instead government will own the process on behalf of the Zambian people. The Minister, who is also a Member of Parliament for Mandevu constituency made the statement in the former Polish capital of Krakow shortly before her return to Lusaka. She was in Poland to attend the Conference of Parties, otherwise known as COP24, a UN-organized meeting called to negotiate guidelines for the implementation of the 2015 Paris Agreement on climate change. “Government will assume sole ownership of the harvest of the Mukula tree but will invite anyone to come and bid at a publicly held auction sale and the proceeds will go straight into control 99, a government bank account” Ms. Kapata says. The Minister says the government of President Edgar Lungu is fully aware of the discussions and interest around the Mukula tree and has therefore taken this position as the best way to spread the benefits of this natural resource across the country. Ms. Kapata says the Mukula tree is too valuable to be left to a small part of the population to reap the benefits. The Zambian government has established a committee comprising selected Ministries, the House of Chiefs and the Zambia Revenue Authority to look into the operationalization of the policy on the sale of the Mukula tree. Authorities expect the modalities to be worked out soon so that Zambians may begin to enjoy the benefits arising from their natural resources. Experts say the tree, used for several purposes around the world that include the manufacture of furniture and medicine, grows in abundance in several parts of Zambia. In most instances, the experts say, where one big Mukula tree stands, there is normally about five small ones growing in close proximity. The tree takes several decades to fully mature. The honorable Minister of Lands observes that since the ban was imposed on the harvesting of the Mukula tree, there has been a significant drop in reports of illegal dealings. 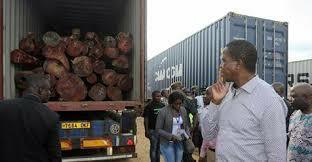 For those dealing in other types of wood such as rosewood, Ms. Kapata says government is encouraging value addition as opposed to the sale of raw materials. “We do not want to be importing finished wood products such as furniture when this can be done here in the country and create jobs for our people”, the Minister says. Zambians are being encouraged to open companies in different provinces of the country for purposes of working in the wood sector.